Paco dos Cunhas de Santar is a 17th century manor house in Santar village in the Dão wine region of Portugal. 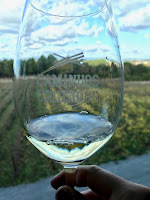 It has an interesting history, it was originally owned by a family named Cunhas who produced olive oil, fruit, and wine. They were connected to the Spanish monarchy. 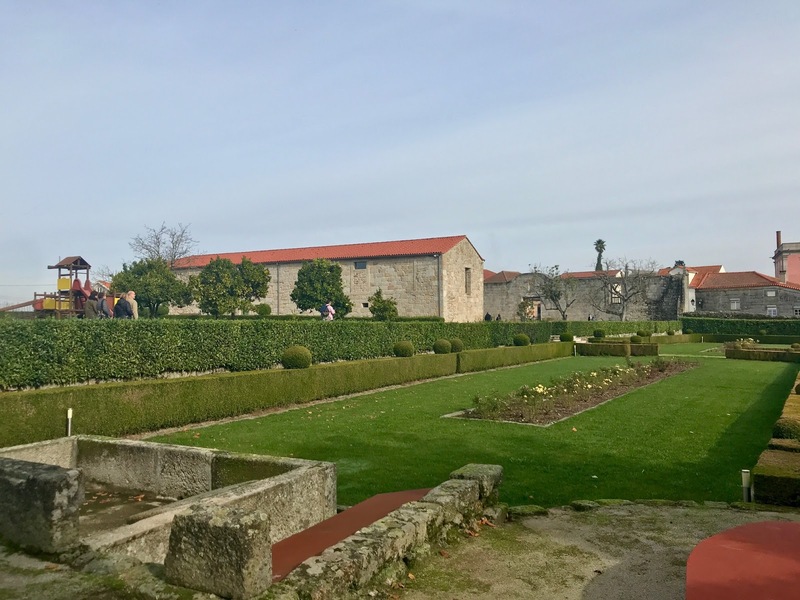 When Portugal regained its independence, the local population destroyed the property in retaliation and it was left empty. 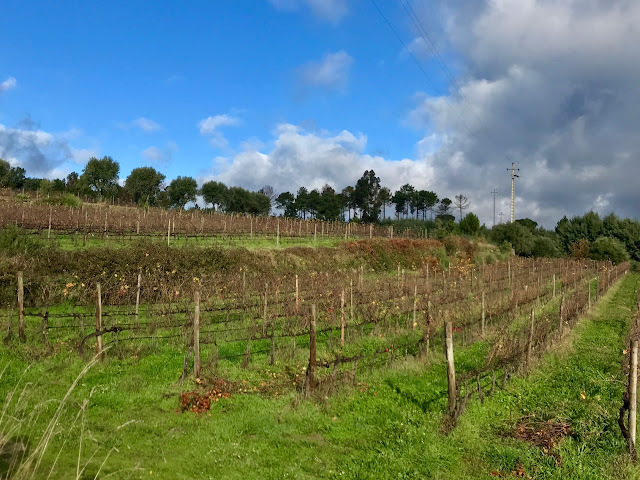 Global Wines, who owns multiple properties and brands in wine regions throughout Portugal, purchased the estate in 2002. Restoring the property has been a long process with the vineyards being the top priority, all of the surrounding 20 hectares of vines have been organically grown since 2007, they launched the first organic wine from the estate in 2012. The original manor house has been restored and now includes a wine shop, event space, and restaurant. It is tourist friendly offering both winery and vineyard tours, along with wine tastings. 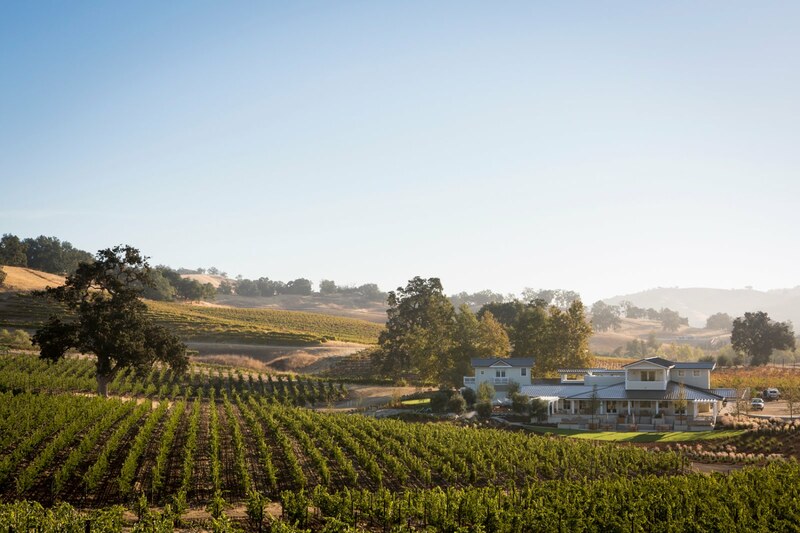 The tastings are outside on the terrace when the weather permits providing guests with vineyard views along with a classic garden to enjoy. There is another house on the property that will eventually be renovated into a high end guest house. Our group toured the garden and vineyards which had an old pigeon house on site. 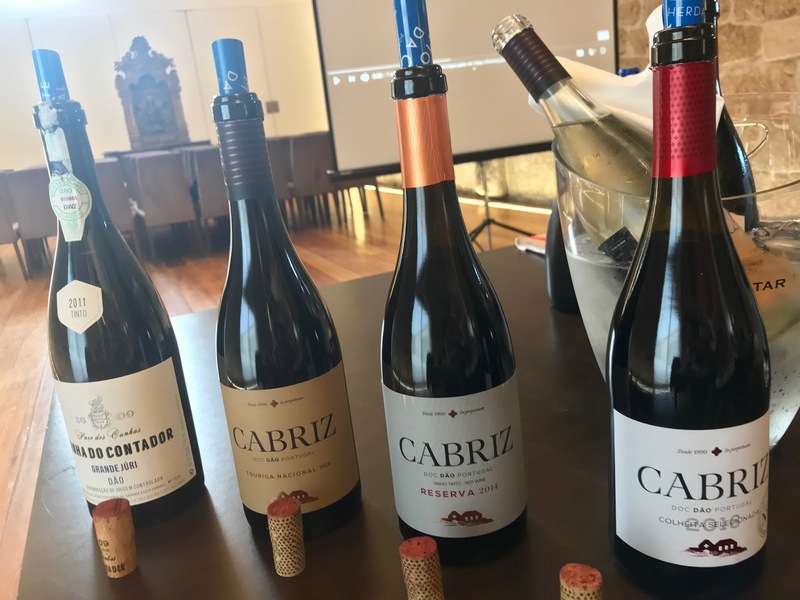 After the tour, we went inside to their event space to learn more about Global Wines and do a tasting primarily from their affordable Cabriz brand sourced from another Dão property along with some special premium selections from the Paco dos Cunhas line. We were then treated to lunch at the on-site restaurant. Our guide, Pedro Teixeira, Senior Export Manager, alerted us that the company has a few restaurants, each making a unique style of cuisine, the restaurant at Paco dos Cunhas is known for their sophisticated nouvelle approach. Affordably priced for under $10 in the U.S., these two wines offer good value for the cost. Cabriz Colheita Selecionada Branco 2017 - Crisp, light, and easy drinking this white blend containing Encruzado, Bical, Malvasia Fina, and Cerceal Branco was aromatic with tropical fruit aromas and flavors with a citrus pith finish. Cabriz Colheita Selecionada Tinto 2016 - This red blend contains 40% Alfrocheiro, 40% Tinta Roriz, and 20% Touriga Nacional was aged for 6 months in neutral oak barrels giving the wine a smooth, round feel with aromas and flavors of mulberry jam and a light toasted note. 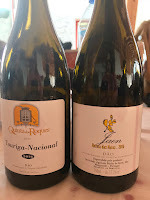 These two wines are made from 100% Touriga Nacional and did not see oak, they are priced between $15-20 in the U.S.
Cabriz Touriga Nacional Branco 2017 - A very unique wine, this is the only white wine from Touriga Nacional that we tasted while in the Dão. The grapes were harvested early to preserve the acidity. The wine had tart red berry aromas and flavors with a fresh, orange citrus finish. Cabriz Touriga Nacional Tinto 2014 - Young and fresh tasting with blackberry aromas and flavors with a hint of bergamot in the soft, lingering finish. 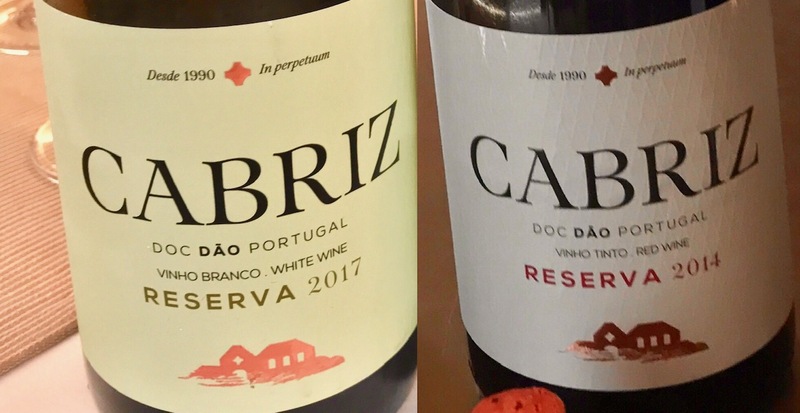 The Reserva wines are priced just under $20 in the U.S.
Cabris Reserva Branco 2017 - This white is 100% Encruzado, it was partially fermented in stainless steel and partially in neutral French oak with three months of batonnage. It is dry, with a medium body, floral citrus blossom aromas and citrus flavors with a hint of nuttiness on the fresh, slightly creamy finish. Cabris Reserva Tinto 2014 - This red blend contains 40% Tinta Roriz, 40% Touriga Nacional, and 20% Alfrocheiro, it was aged for 6 months in French oak barrels, half new and half neutral. 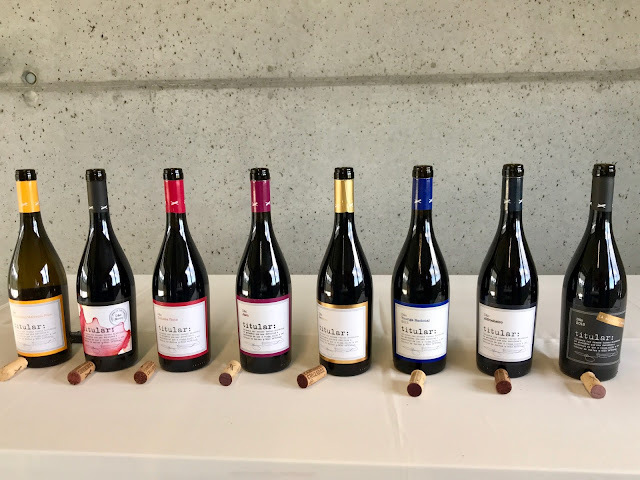 This wine had a bigger structure and more complex robust flavors than the similar red blend in the Colheita collection, it was fruit forward with black plum and berries with notes of violet, vanilla, and baking spices with a lingering finish. 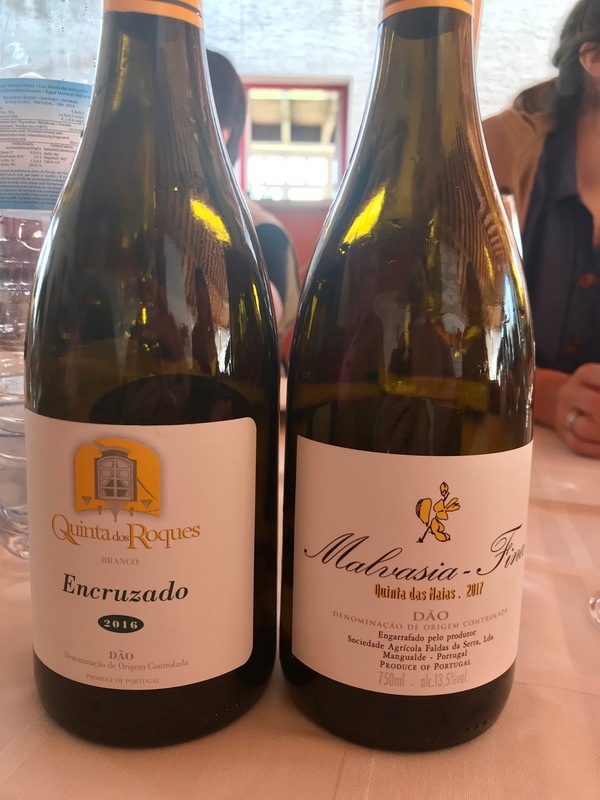 These two limited edition wines are made from grapes sourced from Paco dos Cunhas de Santar estate's premium seven hectare Contador's Vineyard. This unique area is recognized for its special sun exposure which creates an exceptional terroir for long-lived wines. These select bottles are only made in the best vintages and each are numbered. 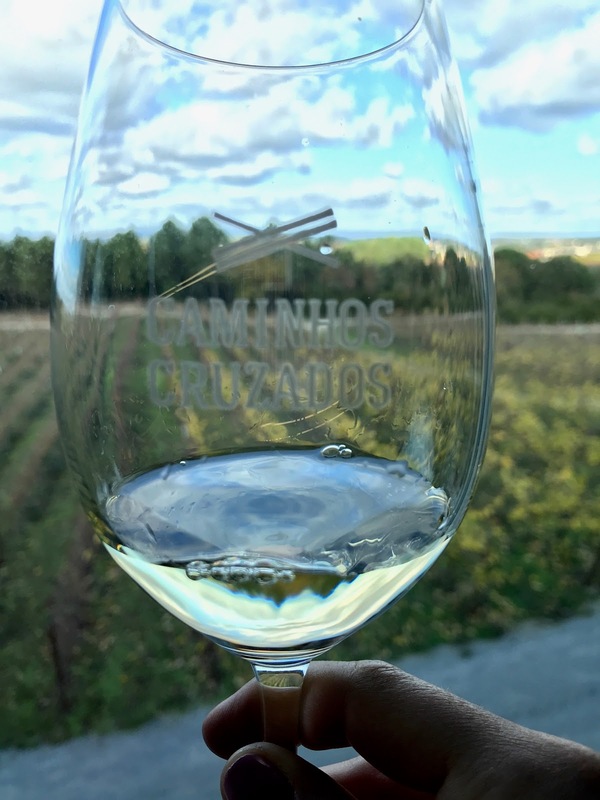 Paco dos Cunhas Vinha do Contador Dão Branco 2014 - This dry, full-bodied white blend is Encruzado-based with some Malvasia Fina and Cerceal and is partially fermented and aged in new French oak for one year. It has tropical aromas of pineapple, mango, and coconut with a creamy feel and a persistent nutmeg-laced finish. Priced at 30 euros. Paco dos Cunhas Vinha do Contador Dão Tinto "Grande Júri" 2011 - A red blend composed primarily of Touriga Nacional with Argonez, and Alfrocheiro aged in new French oak barrels for 18 months. Our group sampled bottle #1594. This full-bodied, dry red has rich, complex aromas and flavors of mixed berries, bergamot, spice, and a touch of dark chocolate and toast in the lengthy finish. Priced at 60 euros in the wine shop. at lunch, unfortunately, no notes were taken. Paco dos Cunhas de Santar is on route 1 of 5 on the Dão Wine Route, it is a recommended stop when visiting the region, reservations are required for the restaurant. Luís Lourenco met our group at Quinta dos Roques, a 35 hectare property in Cunha Baixa in the Dão wine region of Portugal. 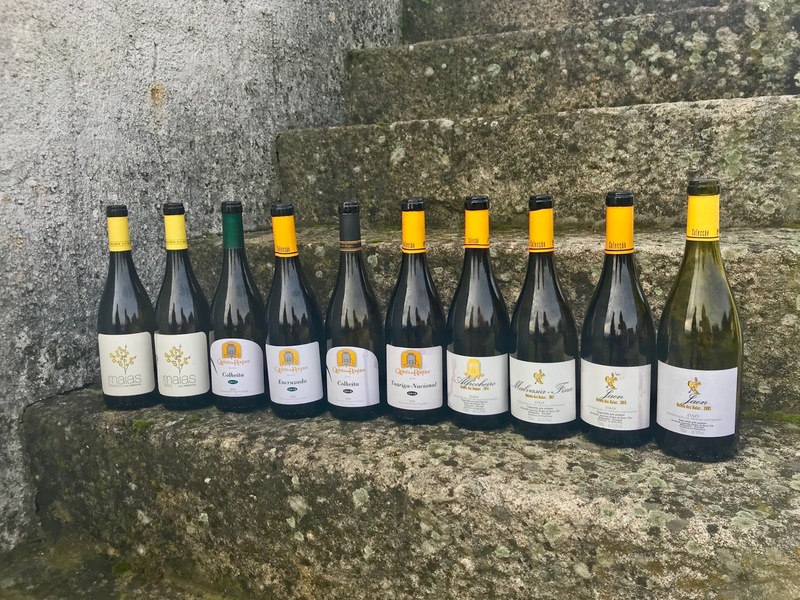 He had set up a tasting of his sustainably made wines from that estate alongside wines from his slightly smaller, 25 hectare organic property, Quinta das Mais. 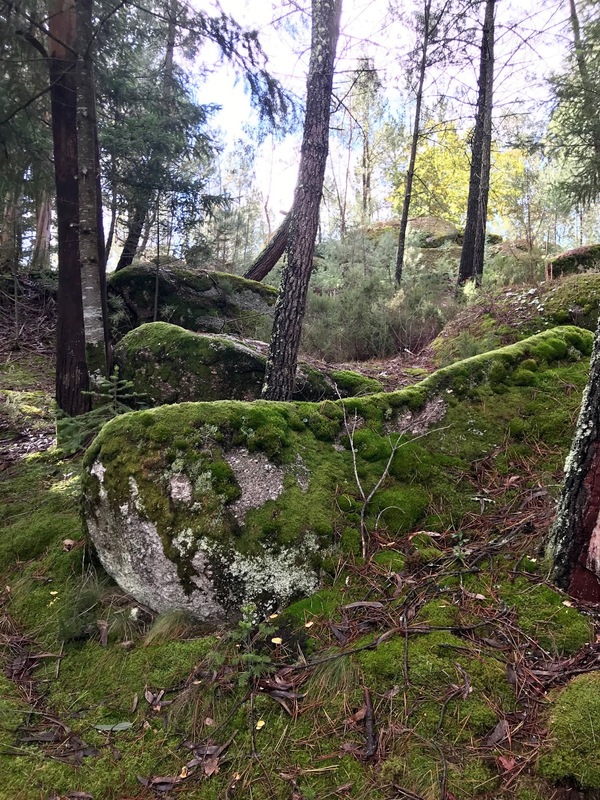 Lourenco's family has owned a portion of the property for generations. In addition to grapevines, they used to farm a diverse array of crops, they determined that to be more profitable they needed to specialize in wine grapes. They bought some surrounding land and the Quinta das Mais property in the late 1990s which is located nearby and continued to focus strictly on growing grapes for wine making. 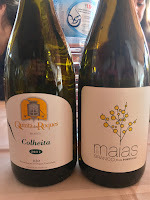 Lourenco said the family made a choice to only use local grape varieties to make true Dão wines. Their main red grapes are Jaen and Touriga Nacional with some Alfrocheiro, Tinta Roriz, and Tinto Cão. Their main white grapes are Malvasia Fina and Encruzado with some Bical, Cerceal Branco, and Gouveio. "Anyone can grow Touriga Nacional and make a decent wine. Jaen and Alfrocheiro are more difficult to grow and to work with but to forget about these other grapes which are part of Portugal's treasure is a big mistake. They are traditional in the Dão and give a good point of reference to the differences in the Dão compared to all the other Portuguese regions." He set up our tasting to showcase both the region's traditional style blends and the more modern single varietal style. He felt this was the best way to get an understanding of what each of the grape varieties offer. Roques Colheita 2017 - This fresh, medium body, high acidity, dry white wine blend composed mostly of Encruzado with some Bical, Malvasia Fina, Cercial and Gouveio. It has fresh aromas and flavors of apples and orange citrus with a mineral-laced finish. Mais Branco 2017 - This medium body un-oaked white blend is sourced from 600 meters up in the foothills of the Serra das Estela mountain range It is composed primarily of Malvasia Fina and Encruzado. It is dry and crisp with light floral aromas and an elegant minerality in the finish which Lourenco stated comes from the granitic sand on which the vines are grown. 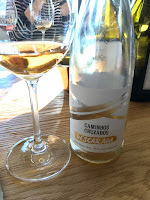 Roques Encruzado 2016 - This single varietal white is partially fermented for 7 months in French Oak giving it a slightly creamy texture with light floral aromas of citrus blossom and and a fresh, dry, citrusy mineral-laced finish. Maias Malvasia Fina 2017 - Fermented partially in Fench oak barrels and partially in stainless steel with technical battonage, this dry white was crisp with bright floral aromas and a fresh finish. Roques Coheita Tinto 2016 - This red blend is composed primarily of Touriga Nacional with Jaen, Alfrocheiro, Tinto Roriz and Tinto Cão. It has floral aromas of violet with mulberry flavors and a slight savory note in the finish. Maias Tinto 2015 - This red blend is composed of Jaen and Touriga Nacional. It was fresh and elegant with juicy blackberry aromas and flavors, a hint of violet, and a lingering spicy cherry finish. Roques Touriga Nacional 2016 - Floral violet aromas with a rich blackberry flavor, full bodied, bigger tannic structure than the previous blends with good acidity and a persistent finish. This wine was aged 15 months in neutral oak barrels. Maias Jaen 2016 - Fruity aromas and flavors of sour cherry with a soft, persistent fruity, cherry finish. This wine was aged 10 months in neutral oak barrels. Roques Alfrocheiro 2014 - Nicely balanced with fresh strawberry aromas and flavors and a lingering fruity finish. 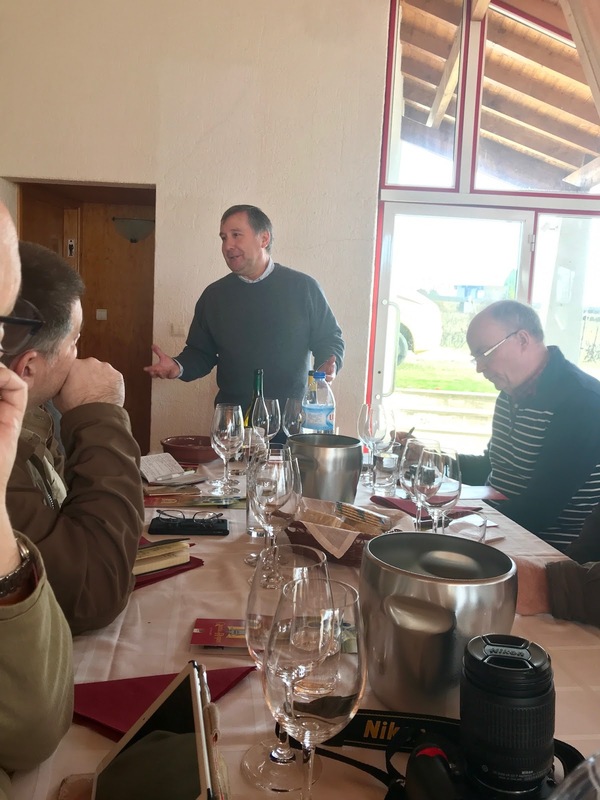 All of these wines are highly recommended, my particular favorites in this tasting were the single varietal Roques Encruzado 2016, the Maias Jaen 2016 and the Roques Alfrocheiro 2014. Quinta dos Roques is part of Route 2 on the Dão Wine Route. It is tourist friendly featuring vineyard tours, winery tours, tastings and a wine shop. Our second stop on the Dão media tour was at Caminhos Cruzados. 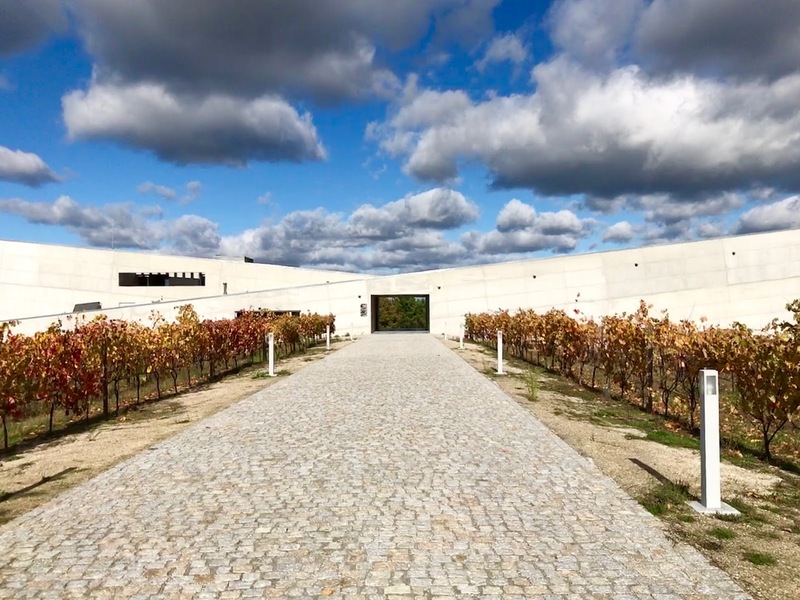 This modern mecca of wine rises out of the vineyards that surround it. The building was just completed last year though the company was started in 2012. 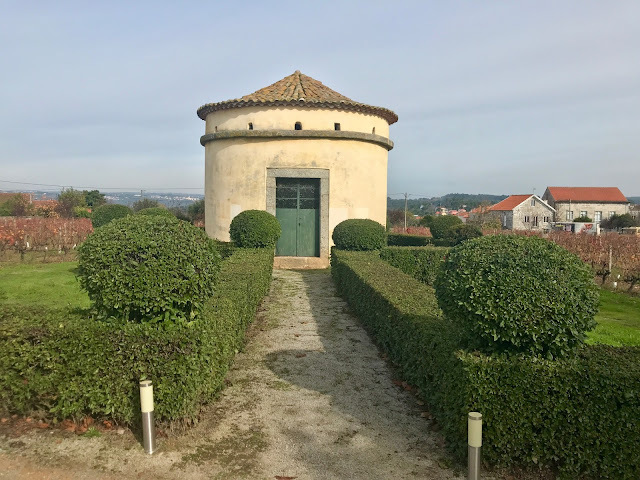 In English, the winery's name means crossroads and the name inspired the building designed by Porto architect, Nuno Pinto Cardoso. The unique modern design has already attracted architecture lovers from the U.S, U.K, Germany and the Netherlands while the wine quality is the draw that will bring them back. 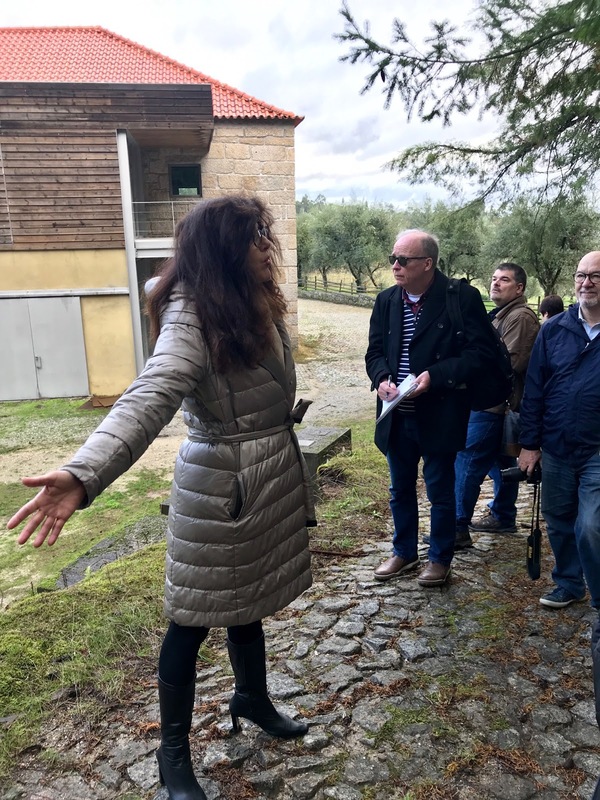 Even though it is the first year for the new winery to be open, they have received a lot of wine tourists, the majority have been from Brazil which is a major market for the wine. small quantities of wine that his family has produced for over 30 years from their own vineyards. 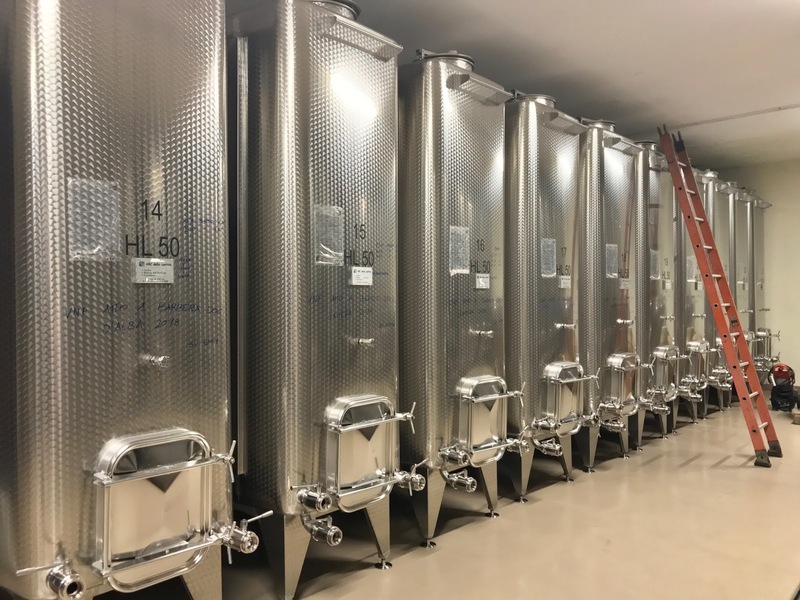 He believes in the quality of wine that the area can produce and decided to convert an old agricultural company into a contemporary wine production facility. Surrounding the modern structure are 17 hectares of land under vine. 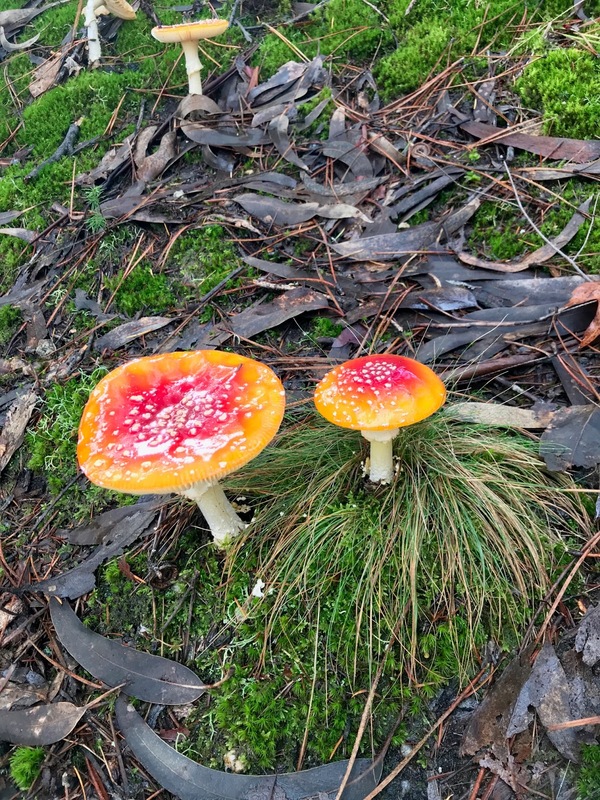 They also own an additional 23 hectares nearby. They were able to double their production this year upping it to 500,000 bottles. Their main brand is Titular but they also offer some smaller production wines under the Caminhos Cruzados label. Caminhos Cruzados is on the Dão Wine Route which guarantees that it is a tourist friendly winery. Reservations for tastings are recommended. Titular Dão Novo 2018 - Made from Jaen (aka Mencía in Spain), this wine was made using carbonic maceration to produce a light, fruity, easy drinking red meant to be consumed young. It has a Welch's grape juice nuance that tastes best chilled. Ideal for outdoor summertime drinking. Titular Colheita Tinta 2015 - This red wine is a blend of Touriga Nacional, Tinta Roriz, and Alfrocheiro which was fermented in stainless steel. It has bright red fruit aromas and flavors with noticeable tannins. Titular Jaen 2015 - Fresh, mixed red fruit aromas and flavors with food friendly acidity. The winery also suggests serving this wine at cooler than cellar temperatures. Titular Reserva 2015 - This red wine is a blend of Touriga Nacional, Tinta Roriz, and Alfrocheiro which was fermented in oak for 12 months. Mixed berry aromas and flavors with vanilla and spice. Titular Touriga Nacional 2013 - This wine tasted of higher alcohol though the label said not. Light blackberry and plum aromas and flavors with hints of violet. 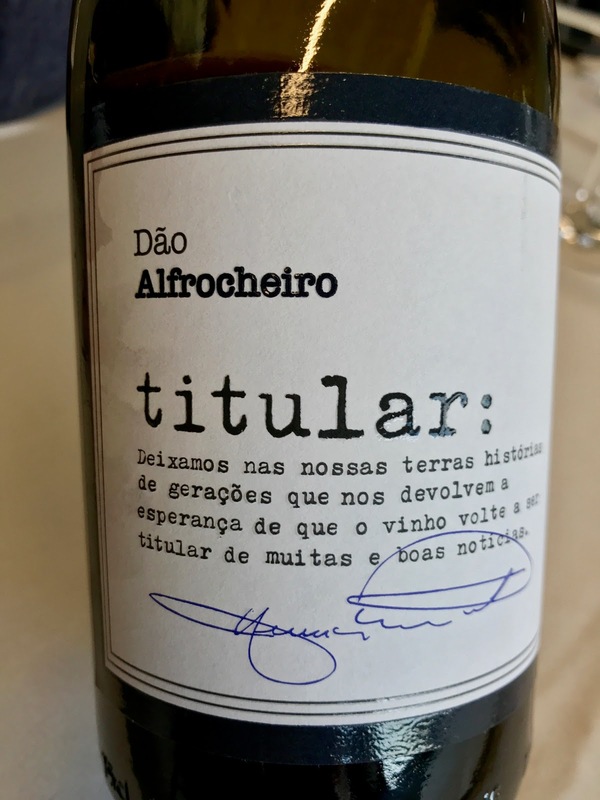 Titular Alfrocheiro 2015 - This wine was partially fermented in stainless steel and partially in French oak where it spent 18 months. It was very aromatic and well structured with velvety tannins, red berry aromas and flavors and a lingering spicy finish. My favorite in this tasting. Titular Dão A Edicão S/ Nome 2015 - This wine is a blend of Touriga Nacional, Tinta Roriz, and Alfrocheiro sourced from a small vineyard near the owner's home. 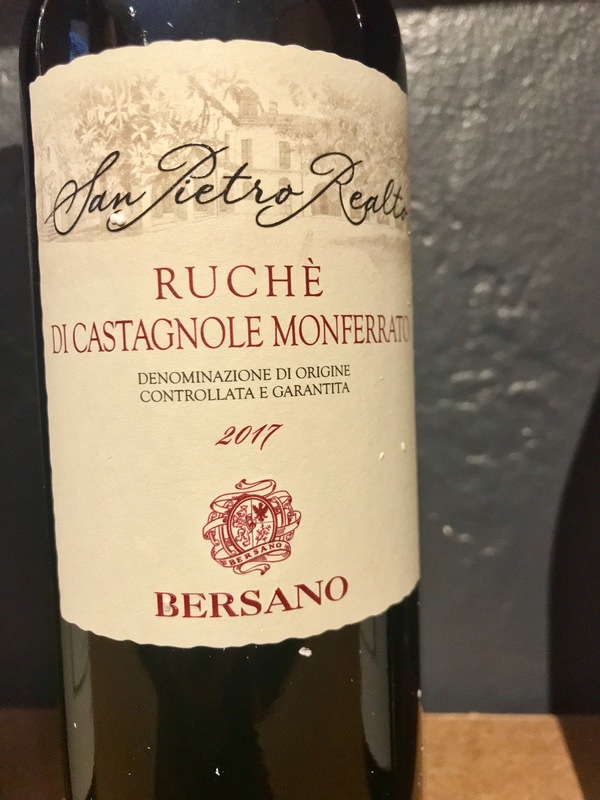 It had a big tannic structure with dark fruit aromas and flavors, a hint of vanilla, and a smoky note in the persistent finish. It spent 18 months in oak barrels. Our group was treated to a lunch of traditional Portuguese food where we enjoyed more of the wine. 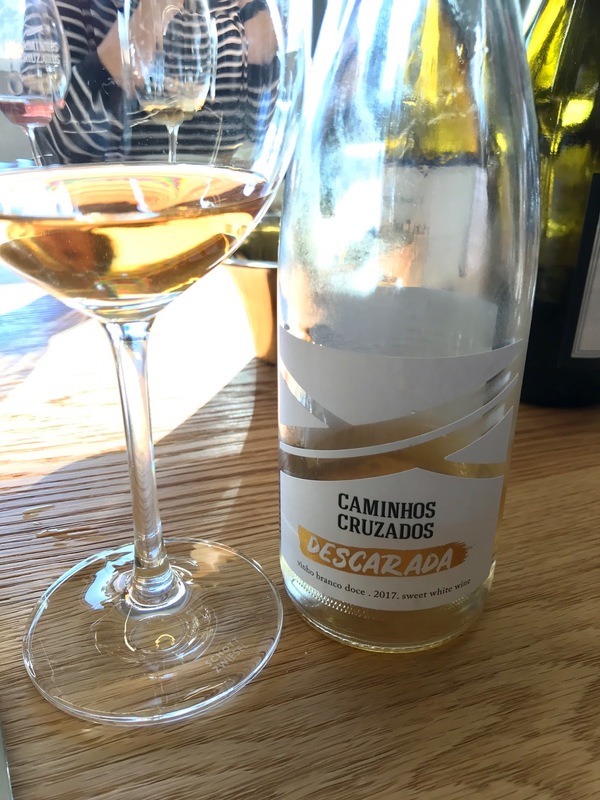 We also tried the Caminhos Cruzados Descarada 2017 - a simple, sweet white wine consumed with dessert. Our first stop in the Dão wine region of Portugal was at Quinta do Cruzeiro where Julia Kemper Wines are produced. 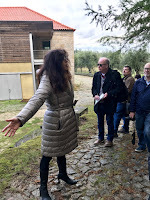 As we headed up to the vineyards, I felt like I was hiking through the woods at camp but the high heeled boots of our leader suggested we were in a more civilized place. 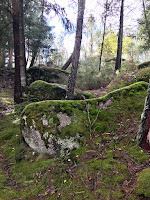 All of the vineyards are surrounded by pine forests with eucalyptus and olive trees bordering the edges. 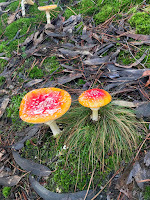 There was a freshness in the air that Julia said came from the surrounding mountains, the diverse plant life and colorful mushrooms suggested something more enchanted. Julia shared her history with us as we walked. The farm has been in her family for more than 400 years, it was always taken care of by the men in her family. In 2000, Julia was a lawyer in Lisbon when her father requested that she take over running the family farm. Why me, she thought. She would have to quit her job and begin a new life and she was not sure that she wanted to do that. She was also hesitant because she knew what a tremendous responsibility it would be and her father stipulated that she could never sell it, it must remain in the family. She was also surprised that she was chosen. It was always the men who had been in charge. Growing up, she had never even been invited into the cellar to see the process of making wine. The family had always sold the majority of the grapes they produced, they typically only made a small amount of wine for the family and for friends. Their wine making was more of a hobby that they were passionate about but it was not the farm's main business. After 3 years she finally accepted. She arrived in 2003 to find that things were not as she would have liked. She found piles of old containers from the 1930s, partially buried, that once had held chemical fertilizers, pesticides, and herbicides. She was horrified to realize how the farm had been run during the previous century. She immediately made the decision to go organic. She also made the decision to stop selling the property's grapes. She wanted to make wine from the farm's grapes and sell that instead. For the next five years, she began changing things. She chose not to produce wine during that time. In addition to getting the property cleaned up and properly disposing of the chemical mess of the past, she also brought in some French wine consultants. 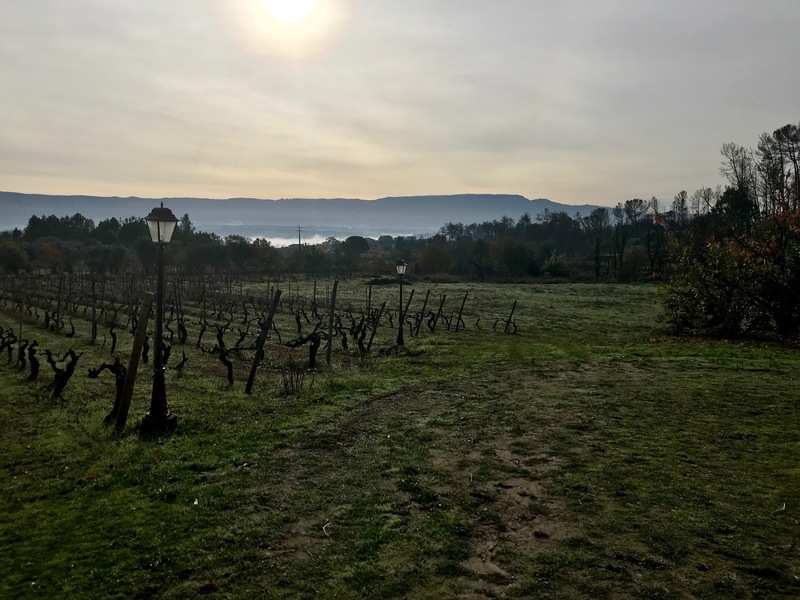 While they helped with the studies of soil and climate to determine where each variety of the native vines should be grown, she was most interested in learning how best to sell the wine that she planned to produce. While Portugal has long been known for their field blend wines, her consultants advised her to make varietal wines instead. They believed that making wines from single varieties of grapes would be easier to sell on the world market. As consumers became more savvy about the different types of wine available, they would be able to distinguish which varietals they preferred. Once she had decided on her business plan, she needed to create a brand. Julia joked that as with many Portuguese, she had a long list to choose from as her full name is composed of 14 names. As a lawyer, she was practicing as Ana Julia de Melo Kemper. She decided on Julia Kemper believing it would be the easiest to pronounce in the international market and feeling strongly that the initials JK had been lucky for others throughout history. 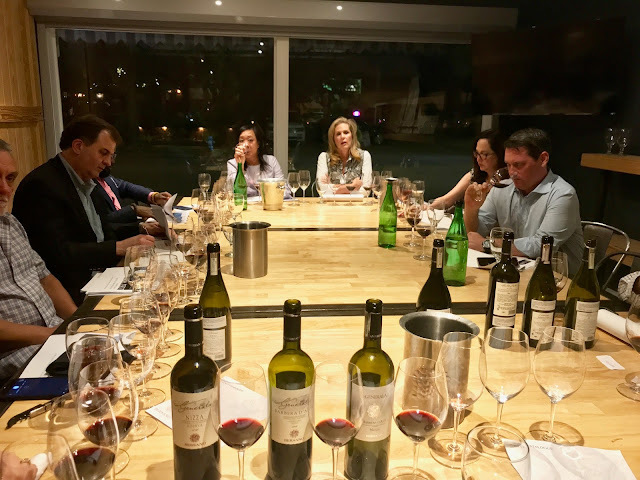 "Currently, the wines are being sold from Canada to Beijing", she stated, "It is not only my full time job, it is my full time passion." What she initially construed as a burden has become, "a very pleasant life, though it is a lot of work, it is worth it." She still feels like she is learning how best to handle her new role and she shared she surrounds herself with good people to help her. The 60 hectare estate has 20 hectares under vine. 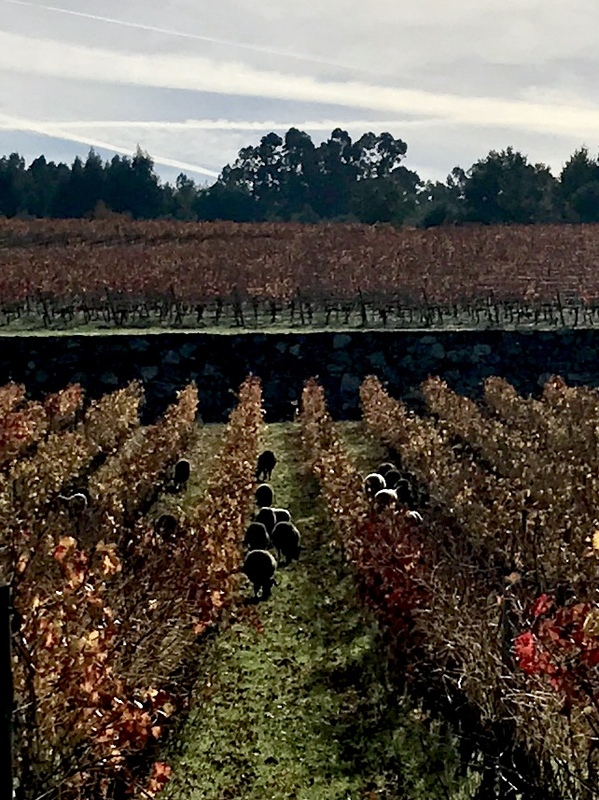 The vineyards sit on soils composed of granite, schist, and quartz on three plateaus. The vineyards are now certified organic using many bio-dynamic principles. Julia summed up her journey, "I became organic because I was organic. I am happy to take care of my family farm and make the type of wines I like and want to drink." 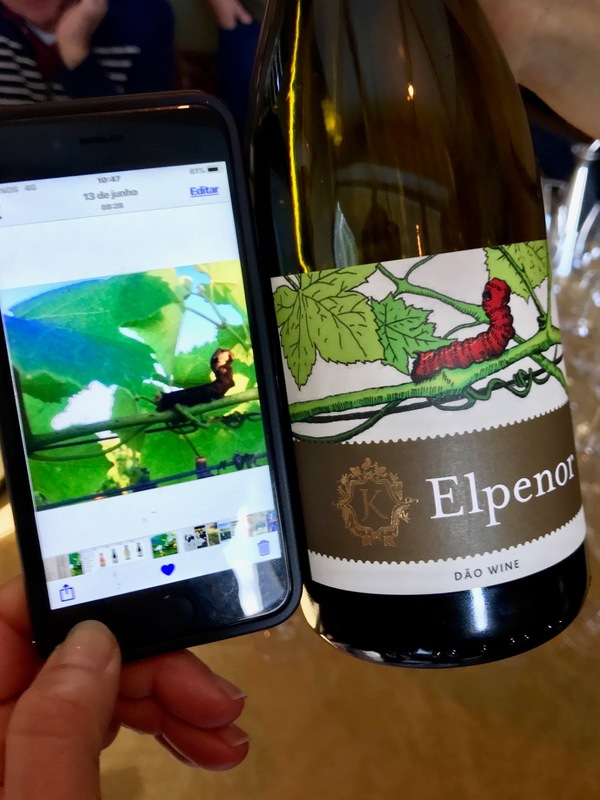 Elpenor Vinho Branco 2017 - This white is fermented in stainless steel, it is crisp and fresh with grapefruit and a light mineral finish. 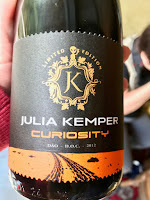 Julia Kemper Vinho Branco 2016 - About 25-30% of this white blend spent time in new French oak giving it a slight creaminess to the texture yet still fresh and light with pear and citrus aromas and flavors with a light tropical note in the finish. Julia Kemper Reserva Vinho Branco 2015 - This Encruzado-based wine spent one year in new French Oak giving it a rich, full bodied, creamy feel with vanilla hints mingling with the peach and grapefruit aromas and flavors through the lingering mineral-laced finish. Julia called this one a winter white. Elpenor Tinto 2014 - This red blend saw no oak. The wine is fresh and juicy with black cherry aromas and flavors and a tart, peppery finish. The label for this line was inspired by a picture of a caterpillar taken in the vineyard. It was peacefully living there because the vineyards are organic. Elpenor Reserva Touriga Nacional 2014 - This velvety red wine spent four years in oak barrels. It has fresh aromas and flavors of ripe black cherry and blackberry with a slight almond skin note in the lingering finish. 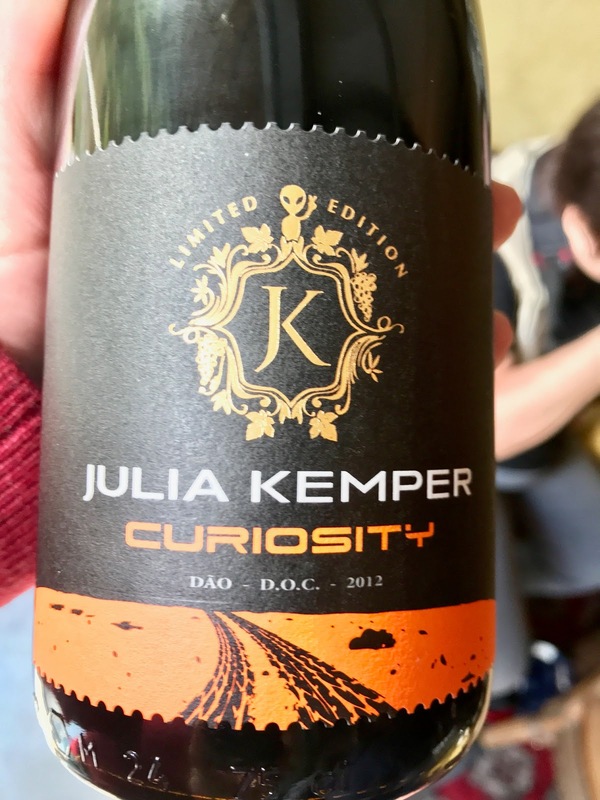 Julia Kemper Curiosity 2012 - This red wine is composed primarily of Alfrocheiro with 10% of Touriga Nacional, it spent 2 months in three year old French oak barrels. It was fruity with raspberry and cherry with a light floral note of violet and hints of fresh herbs through the persistent finish. 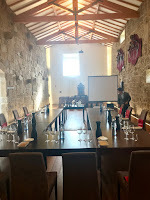 If traveling to Portugal, this winery is on the Dão Wine Route. The wineries that are part of this group are tourist friendly, though reservations are required. 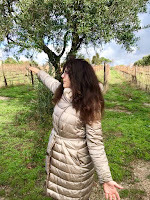 Late in the afternoon, Daniela Veglio, Mauro's wife, met me outside of the winery to show me the surrounding vineyards and tell me their story. It all began with Mauro's grandfather, Angelo Veglio. Angelo was a sharecropper and part-time butcher who had a dream of owning his own vineyards and making wine under his own name from the local grapes that he loved. In the 1960's, he was able to purchase his first property located in Gattera and the realization of his vision began. 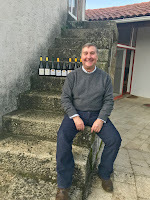 By 1979, he was able to buy a rundown property called Cascina Nuova with a farmhouse which now, after many additions, houses the current tasting room, cellar and winery. Angelo had three sons but only Mauro shared his dream. Mauro Veglio took over in 1986 when he was 25 years old. 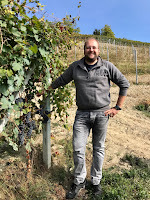 He began the restoration of the Cascina Nuova property and started experimenting with different winemaking and vineyard techniques. Mauro Veglio started his own brand in 1992. These were the years that the Barolo Boys began making waves through the region. 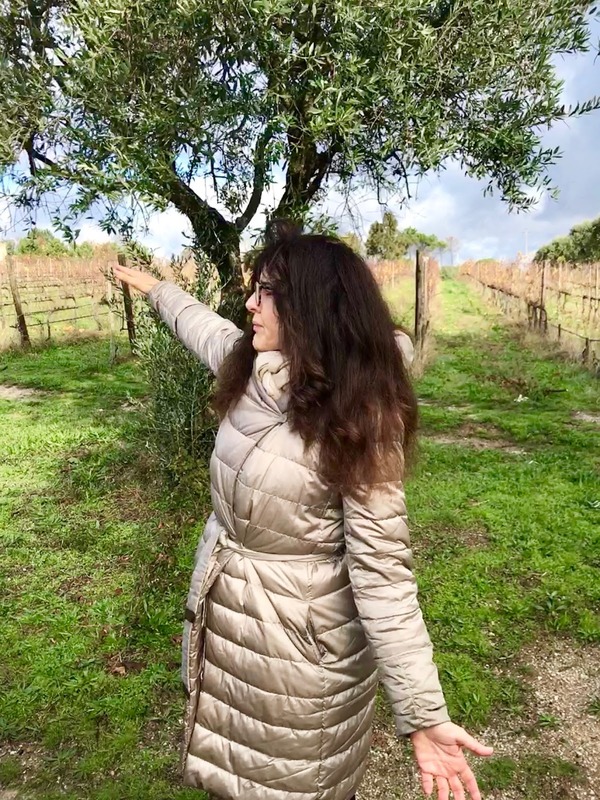 Daniela shared, "Most of the people here were just farmers, peasant workers, stuck in the hands of the buyers that set the price for the grapes. What could anyone do? You can't hold onto your grapes forever, they have to be sold. Our parents and grandparents had struggled to survive, the Barolo Boys came from the lowest level of society. 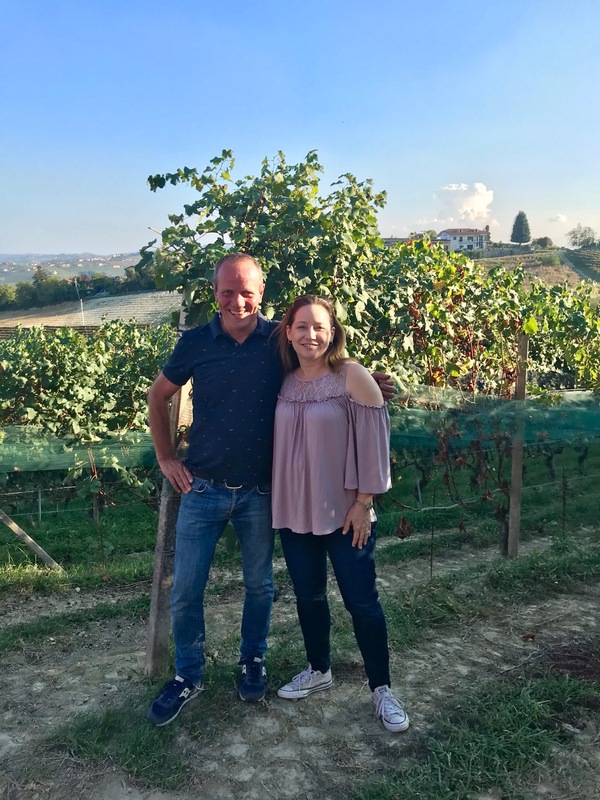 After traveling and seeing more of the wine world, we learned it was important to work together and share our experience for all to be successful." They began to improve the quality of their wine faster this way. The winemaking in the region began to change. For the first time, reduction of yields in the vineyards became important as did cleanliness in the winery. "It has been good for everyone, it has become difficult to find a bad wine in the region." I briefly met Mauro outside of the winery where he was relaxing. They had just completed bringing in all the grapes and the end of a good harvest showed on his face. He kindly went back to the vineyard with me for a quick photo-op before returning to the winery to oversee the clean up. Daniela and I went into the tasting room and she introduced me to their nephew, Alessandro. 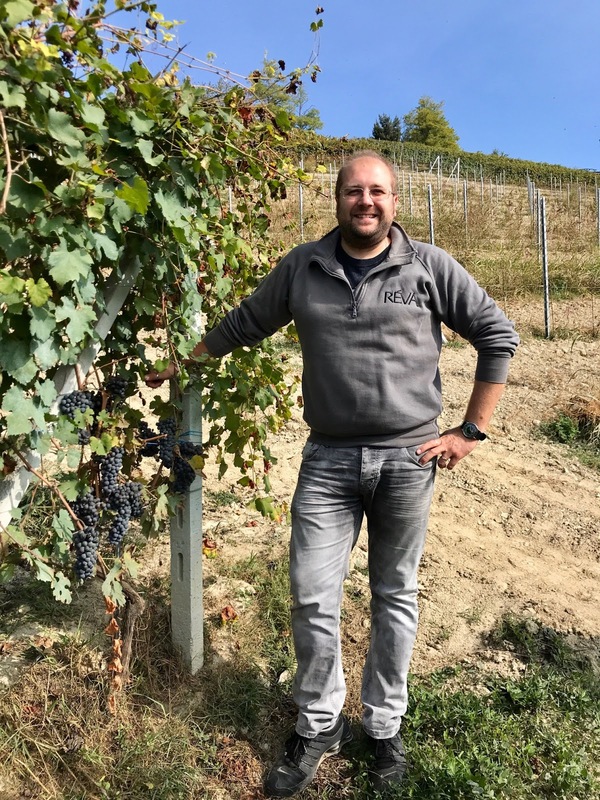 Alessandro is the son of one of Mauro's brothers, he began making wine in 2005 under his own name but decided to join Mauro and Daniela in 2017 bringing five additional vineyard hectares to their venture. As they set up the wine for the tasting, Daniela spoke of traveling to sell their wines in the 1990's. 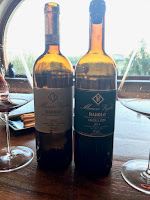 "The first time new people tried Barolo, they were shocked at its structure. They see the list and see the names and prices. They want to taste the most expensive and famous wine from the area but then they were surprised at what it is." Alessandro expounded, "It is quite strange when I hear about the early years of my aunt and uncle. 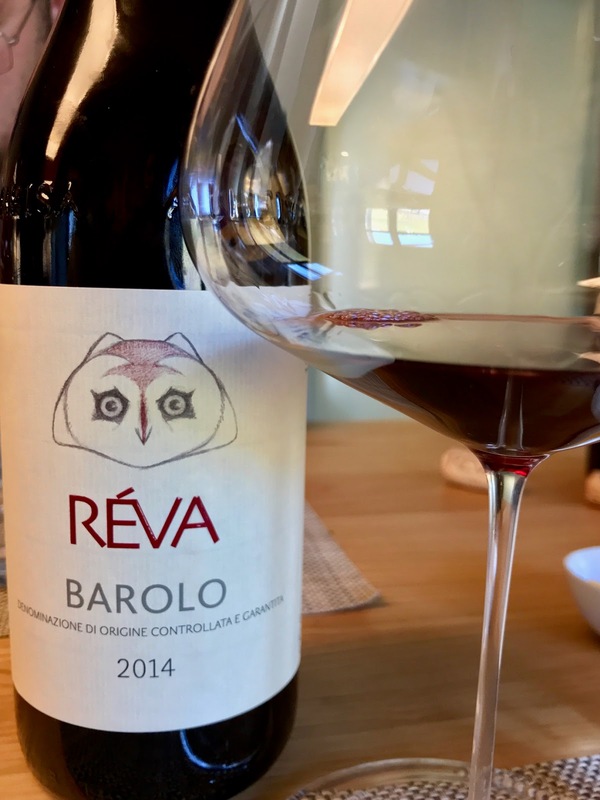 When they spoke with people as they began to travel, the Barolo name was somewhat known but not many had tasted it yet. Many people found it to be very aggressive at first taste. It is what we have always had, for us, it is not so tannic." 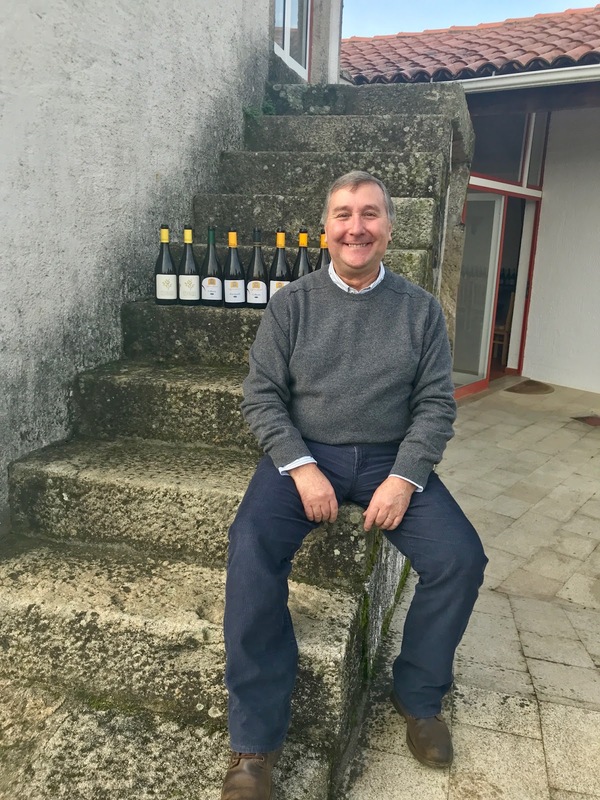 Currently, Mauro Veglio produces 120,000 bottles a year from their 19 hectares of vineyards located in La Morra, Monforte d'Alba, and Barolo. They use no chemical pesticides, herbicides, or fertilizers relying on pheromones to confuse harmful insects and limit their reproduction and cover crops composed of beneficial plants and manure. Mauro and Daniela's respect for Alessandro's work is what led to their initially sharing cellar space with him and their hope now is to see him continue their work throughout the coming years. 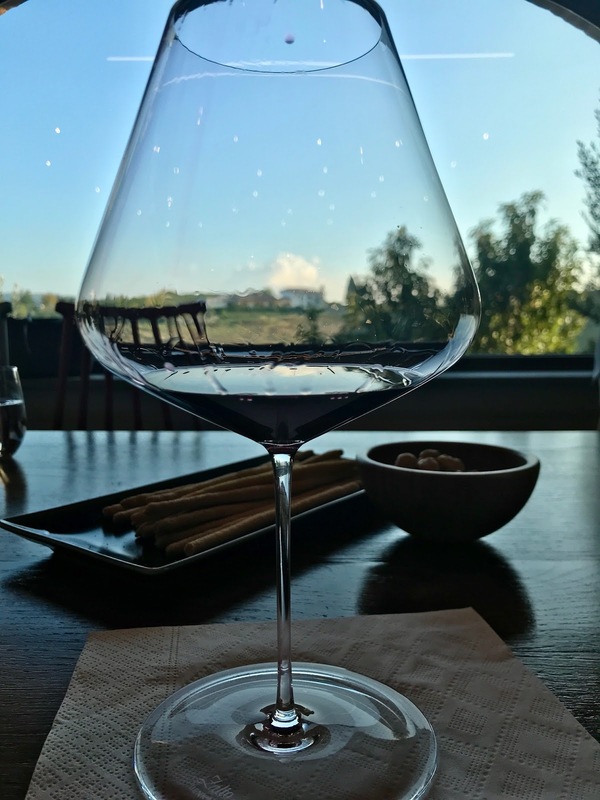 Mauro Veglio Dolcetto 2016 - Simple, smooth, and easy drinking with fresh black cherry aromas and flavors and a light floral note. Mauro Veglio Barbera d'Alba 2017 - Fresh and fruity with sweet ripe plum aromas and flavors and a touch of minerality in the finish. 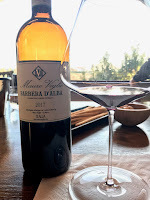 Mauro Veglio Barbera d'Alba Cascina Nuova 2016 - From older vines than the previous wine sourced from the vineyard around the winery with sweet red fruit aromas and a light spicy finish. Mauro Veglio L'Insieme Langhe Rosso 2015 - A blend of 40% Nebbiolo, 30% Barbera, and 30% Cabernet Sauvignon, this wine was created in the 1990's to accommodate the newly initiated Nebbiolo drinker but is still an important wine in the line. Rich ripe red fruit aromas and flavors with vanilla, and spice. 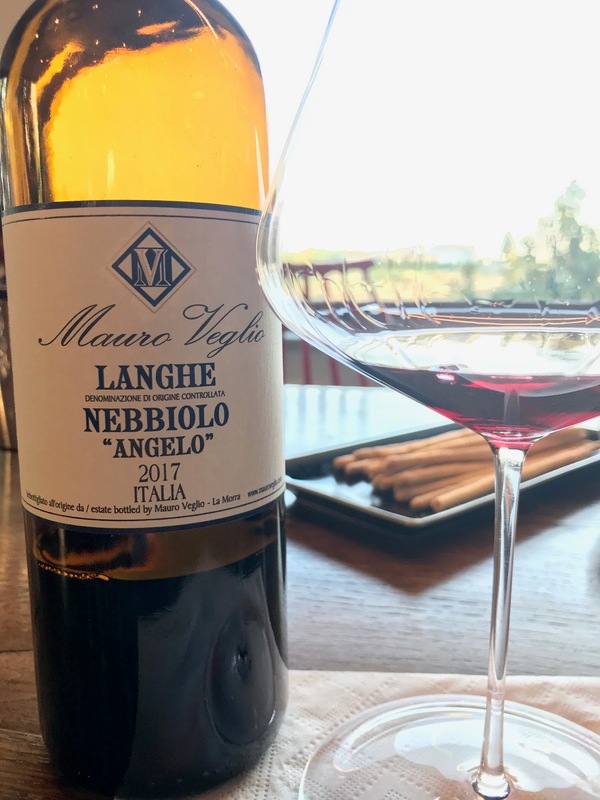 Mauro Veglio "Angelo" Lange Nebbiolo 2017 - Named after Mauro's father and Alessandro's grandfather, floral rose and fruity cherry flavors, fresh and aromatic. Mauro Veglio Barolo 2014 - Fresh and round with intense red fruit aromas and flavors with a touch of vanilla; cohesive and elegant with a savory note in the persistent finish. Made from the youngest grapes from the La Morra and Monforte d'Alba vineyards. 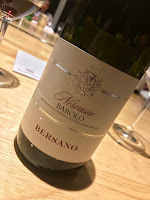 Mauro Veglio Barolo Arborina 2014 - Elegant, fresh and aromatic with delicate floral notes of rose and fruity raspberry and black cherry flavors, nicely balanced with a spicy, mineral-laced finish. My favorite of the tasting. 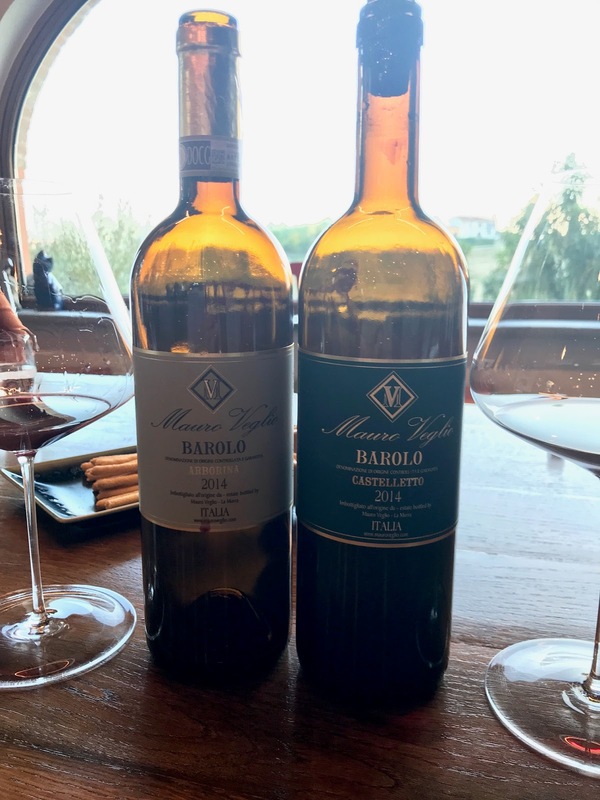 Mauro Veglio Barolo Castelletto 2014 - Big shoulders, more tannic and intense with more concentrated aromas and flavors of mixed berry jam with dried herbs and a licorice note in the lengthy finish. All of the wines are highly recommended. 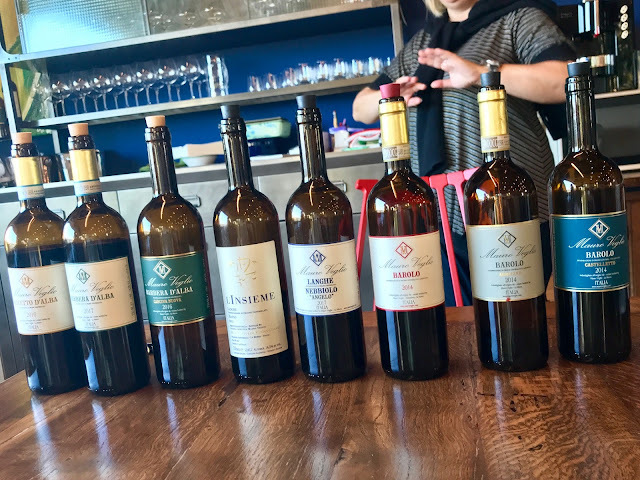 A couple of weeks before I went to Piemonte, Paolo Lovisolo, Bersano's Direttore Commerciale, was in Houston for a tasting at Vinology for a tasting with some local wine professionals. He poured everyone a glass of Gavi, a crisp white wine, to get started. 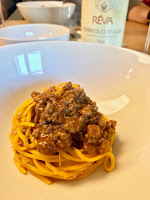 "Piemonte is a region that is not so easy to approach. 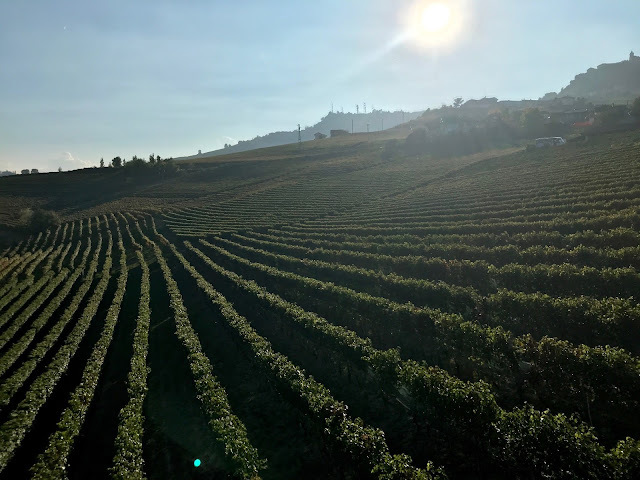 Everyone knows Barolo and Barbaresco, the vineyards and hills are Unesco World Heritage Sites but it is still a region that is difficult to understand." Giorgio Caflisch, an Italian wine teacher at The Texas Wine School, volunteered that he tells his students that Barbera is the gateway to Piemonte wines. Lovisolo agreed with Caflisch and then continued his story. Bersano is a historic company founded at the beginning of the 20th century in 1907 by Giuseppe Bersano, who had a passion for wine. Initially, he bought grapes from local growers but then began investing in land for Barbera believing that would be the future of the company. His uncle, a lawyer, joined the company and began marketing the wine. He also helped to purchase more vineyard land. The two felt that vineyard management was the key to making great wine. Time would move on and the company would eventually be sold to Seagram's who sold off some of the premium land holdings in Barbaresco and Barolo including the Castle of Barbaresco which is now owned by Gaja. The company would change hands again in the mid 1980s. Today, Bersano is the largest private owner in Piemonte with over 230 hectares of vineyards in ten estates. 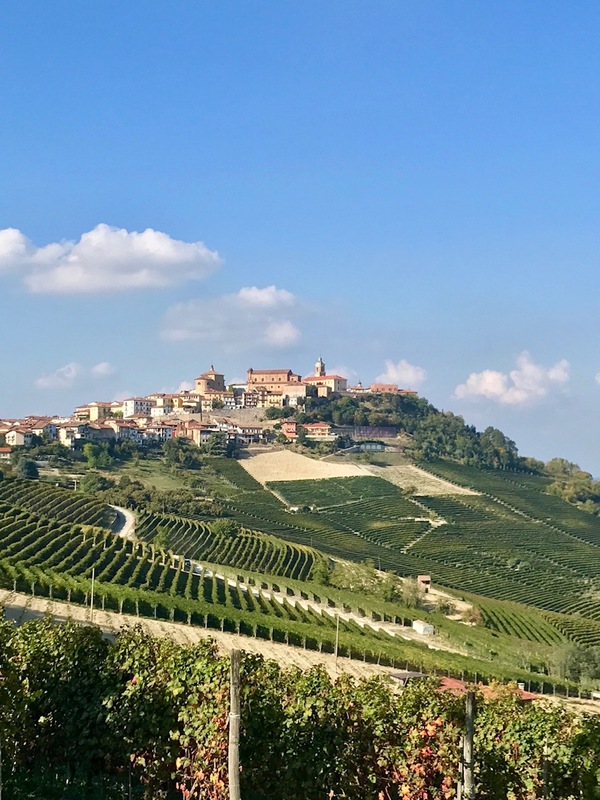 While the focus is on Barbera in Asti, they also produce Gavi, and have 12 hectares in Serralunga, the highest village in the Barolo region. Lovisolo described the company as classic producers wanting to express the soul of the microclimates they possess. He said the company has no interest in making international style wines, they wish to focus on the uniqueness of their vineyards. They vinify and age in the region's traditional ways using big barrels that hold 10,000 liters. The company is located in Asti where Barbera is the most important grape. 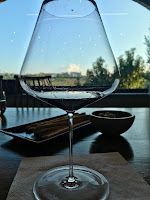 It is planted in the best positions and in single vineyards, because of this, Lovisolo stated that he believes that Barbera d'Asti is better than Barbera d'Alba. The company has also produced white Gavi wines for 40 years. They don't own the land from which these grapes are sourced but have had a long-term handshake deal to rent the the land. Gavi is made from the Cortese grape and comes from the Gavi village. The vines are grown on calcareous soils with some clay. The area receives some wind from the seaside at night causing temperature drops which help to maintain the grape's natural acidity. Lovisolo stated the the region has more ocean influence than most of Piemonte. 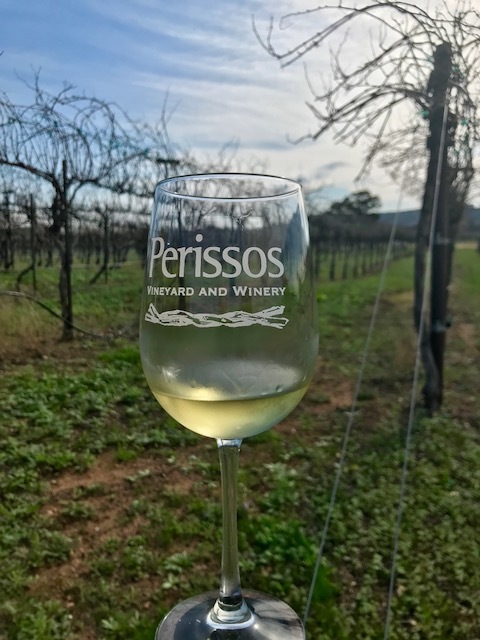 Bersano Gavi 2017 - Easy drinking and crisp with good acidity, delicate and elegant with light floral notes, pineapple, tangerine, and a mineral-laced finish. Bersano Barbera d'Asti 2016 - Fresh and fruity with red cherry and hints of eucalyptus, an easy drinking wine. This wine is a classic blend from several areas, fermented in stainless steel before being aged in large barrels for three months. 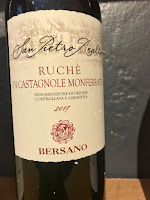 Bersano Ruche - Aromatic with rose and red fruit with velvety tannins, fresh acidity, and a spicy white pepper finish. Lovisolo referred to it as "easy to appreciate and enjoy" and alerted the group that most is sold in the Italian market. They only have 25 hectares of these grapes, the wine is produced only in stainless steel. Bersano Barolo Nirvaisco 2013 - Big tannic structure with red cherry, dried herbs and hints of leather with a lengthy finish. Lovisolo stated, "This is not an easy wine, it is not for beginners, it is finesse in a glass." Bersano Barolo Riserva 2011 - Intense aromas of black cherry, mint, and hints of violet with a slight savory note and a persistent finish. We followed this with a vertical of the company's Barbera d'Asti from the Nizza sub-region. 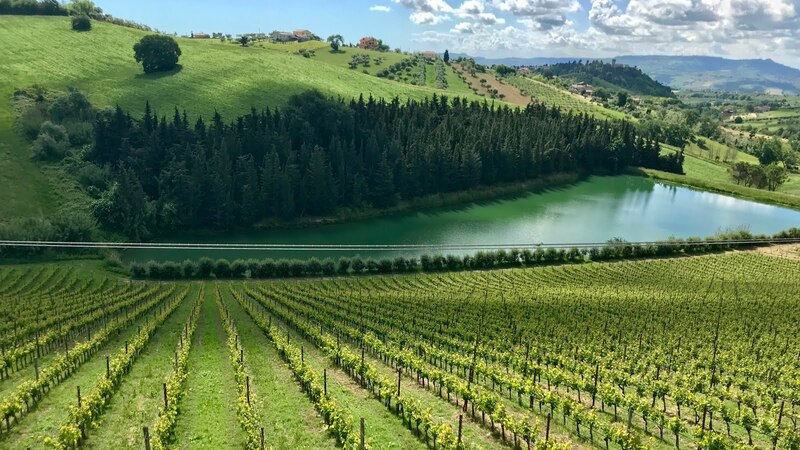 Bersano has a 55 hectares spread through four estates. Nizza, located in Monferrato in the heart of the Barbera d'Asti district, became its own DOC in 2014 and is known for its high quality Barbera. 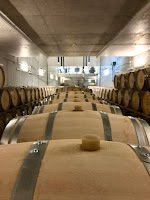 The wines age for 18 months minimum with Riserva wines aging for 30 months. 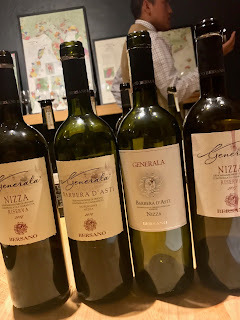 Generala Nizza Riserva 2014 - Fresh, fruity, young and drinkable. After a wet, cool, and cloudy summer, September sun ripened the grapes fully. 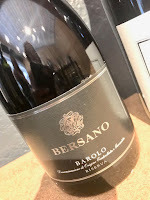 Bersano Barbera d'Asti Nizza Superiore 2010 - Leathery. It was a great vintage though this bottle was a little tired. From a wetter than average year which began with a colder than average winter followed by a hotter than average summer. Bersano Nizza Barbera d'Asti 2007 - Fresh aromas of red cherry with good acidity and a light spicy finish. 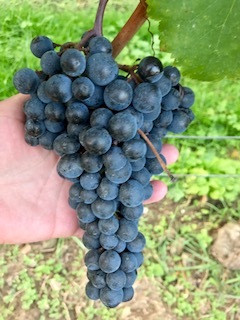 From an early harvest, after a hot and dry summer. 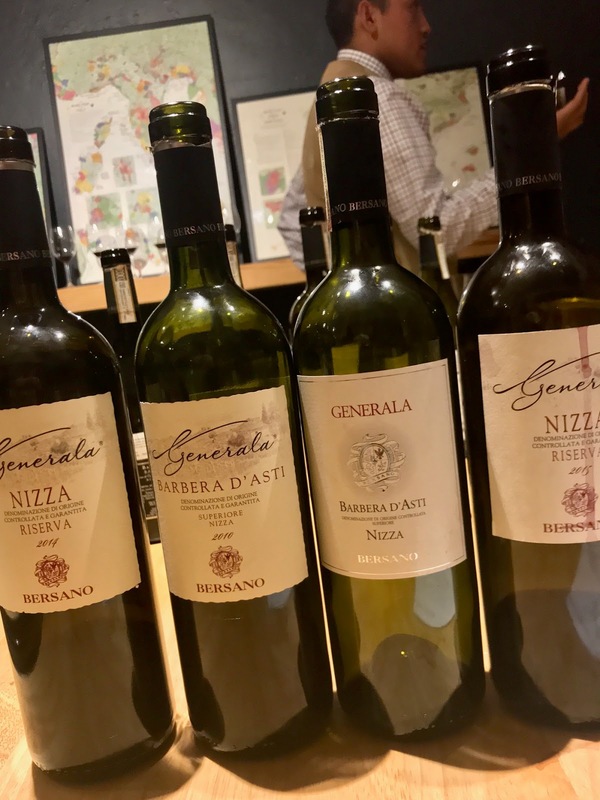 Generala Nizza Riserva 2015 - Less acidic than the 2014 with mixed cherry/berry and a hint of chocolate. A cold winter, rainy spring, and hotter than average summer. 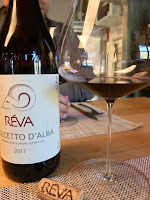 Réva, a luxury retreat tucked in between the hills of Monforte d’Alba, was a bit of a surprise to me. 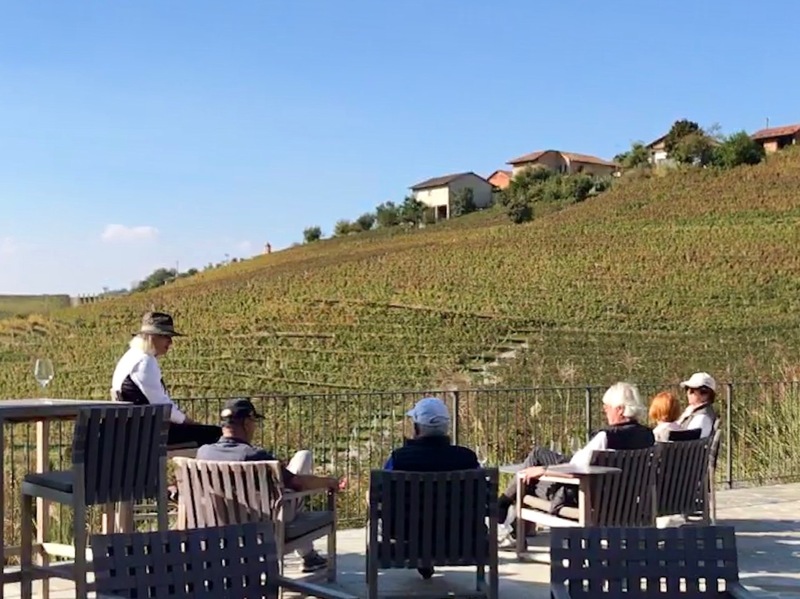 With golf, a spa, a pool, hot tub, gourmet restaurant, and woods for truffle hunting, it completely exceeded my expectations of more of the expected beautiful views and great wine. 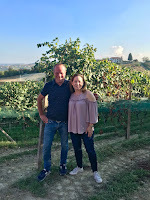 Daniele Gaia, Réva Sales Manager, led my on the tour of the vineyard and joined me for lunch along with a wine tasting. 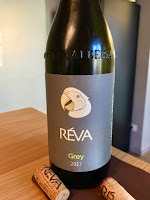 He shared that the owner of the winery is Czech and that the name Réva translates to grapevine. The vineyard was beautiful and full of grapes on the brink of harvest. 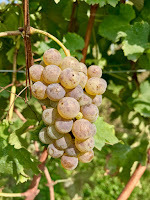 While the expected local grapes Nebbiolo, Barbera and Dolcetto were all present, I was surprised to learn they also have Sauvignon Gris in the vineyard. 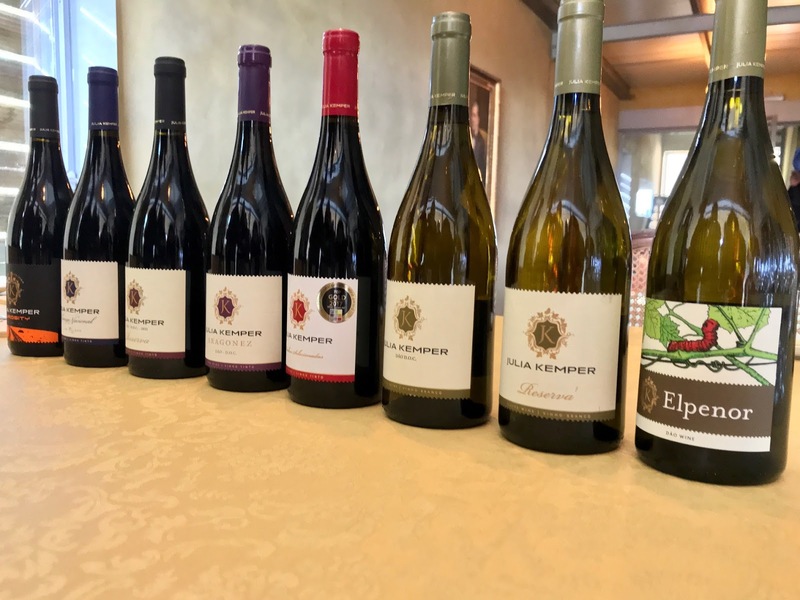 I later learned from winemaker, Gianluca Colombo, that it is one of his favorite wines and he was excited to see how it would perform there. 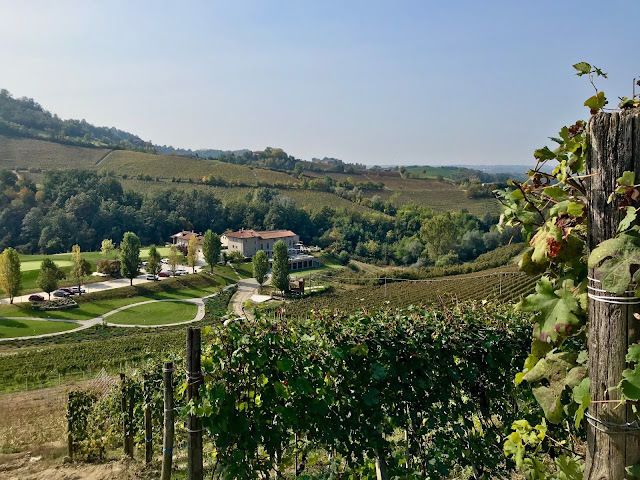 The winery was established in 2013 in the heart of the Barolo area. Their vineyard practives are focused on sustainable and organic grape growing. Réva is dedicated to maintaining a healthy plant diversity in and around the vineyard with more than 130 varieties of herbs and grasses growing. They choose to use only certified organic fertilizers. While in the winery, they work exclusively with native yeasts and limit the use of sulphur as much as possible. The gourmet restaurant, FRE, is managed by Chef Paolo Meneguz, who has honed his skills in multiple Michelin rated restaurants in Europe. I enjoyed an abbreviated tasting menu for lunch featuring classic Piedmontese dishes. Meals can be ordered a la carte or tasting menus from 4-10 courses are also an option. The kitchen can be viewed through glass doors when sitting at the Friend’s Table which is where Gaia, Colombo, and I ate. We started with the 50/50 Sauvignon Gris and Sauvignon Blanc which is labeled as Langhe DOC Grey 2017. There are only 6,000 bottles produced. It was deliciously drinkable and fresh with citrus, tropical notes and hints of sage. Gaia shared that the labels were inspired by the owner’s admiration for the work of Petr Nikl, a Czech artist. 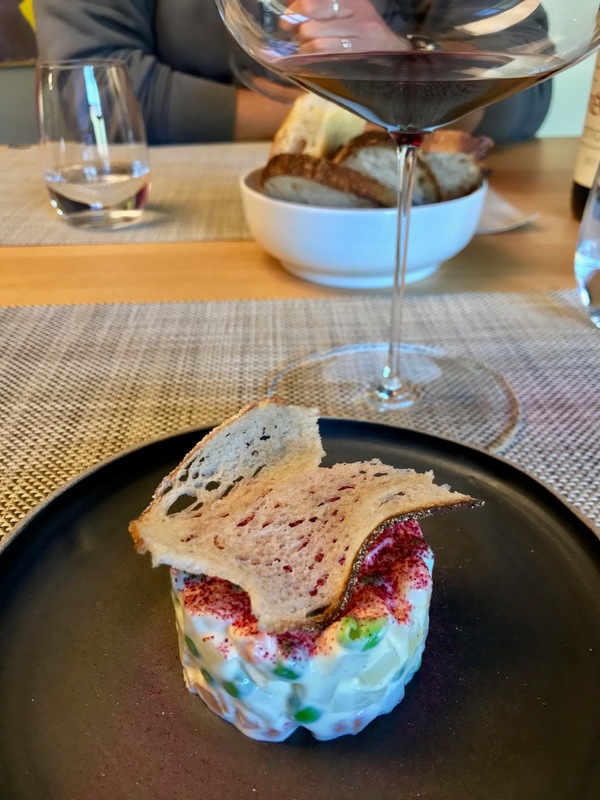 Lunch started with the Dolcetto d’Alba 2017 which was fresh, fruity, and delicious. The chef paired it with a Russian salad which is similar to potato salad. I had this three times while in Piemonte, this was my favorite rendition. 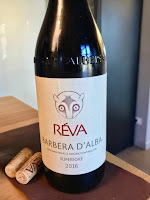 Next up was the Barbera d’Alba Superiore 2016, this dry red had sweet, ripe raspberry aromas and flavors with a fresh, spicy finish and was served with carne cruda all’albese, also known as steak tartare made from the local beef. The Nebbiolo d’Alba 2016 came next. This everyday Nebbiolo was very approachable and full of red rose aromas. It was served with a freshly made, hand cut pasta called Tajarin which is yellow colored due to the egg yolk used. 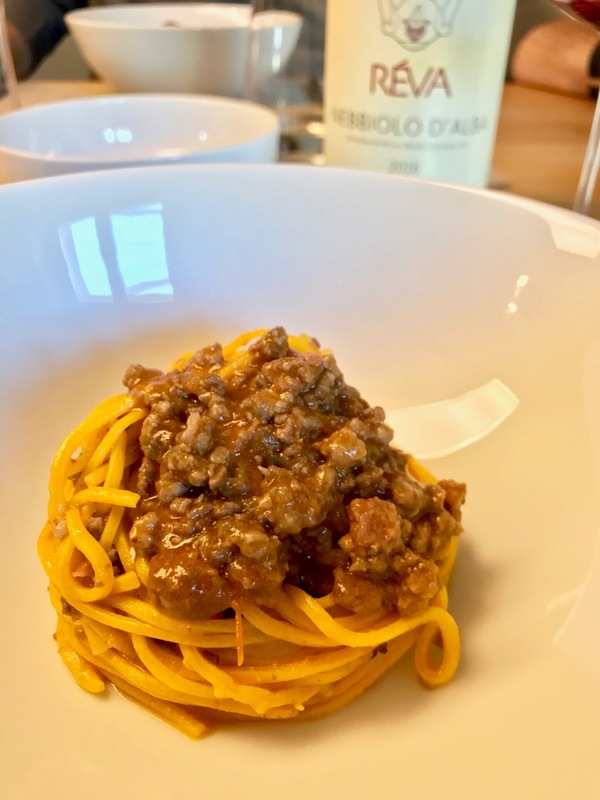 It was topped with a meat sauce. While we were enjoying this wine, Gaia also poured the Barolo 2014 which is sourced from multiple vineyard areas. This Barolo Classico was approachable and delightful with the pasta. Full of floral and herbaceous notes over ripe berry flavors. It was full bodied and surprisingly soft, yet still with noticeable tannins. For the lunch finale, I was served Barolo Ravera 2013, this fresh, lively, and elegant red stole the show with floral notes, mixed berry flavors, and hints of tobacco with velvety tannins. 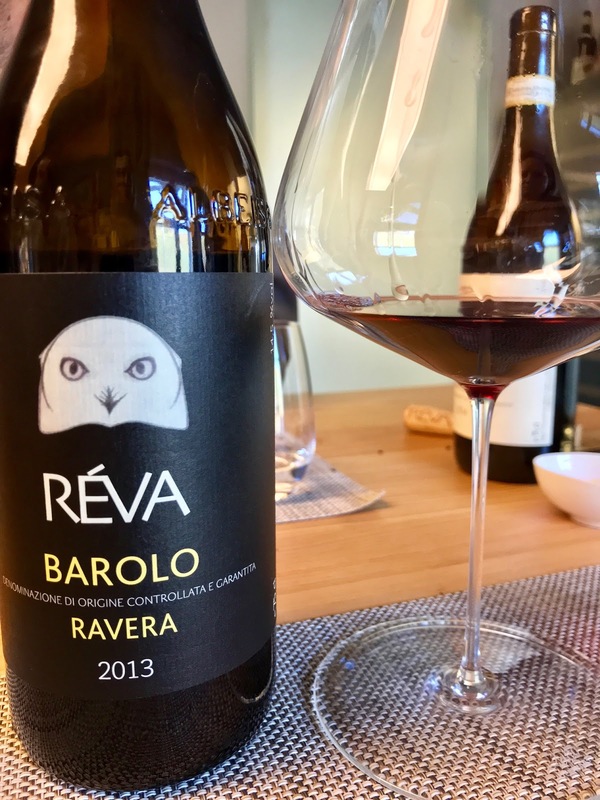 This wine comes from the Ravera, a single vineyard in Novello. When I returned to Houston, I found it at both Cru and Vinology. 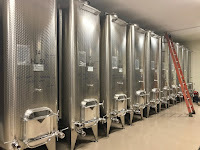 After lunch, we headed into the winery where Daniele Gaia pulled tank samples of both the Sauvignon Gris and the Barbera. Even at this early state, it would appear that 2018 will be an excellent year for both. Hotel guests can enjoy the spa and the 9 hole Executive Pitch and Putt course with their stay. The infinity pool and hot tub provide the perfect place to relax after a day of wine tasting while the terrace is the perfect place to relax with friends over a glass of wine. The winery is tourist friendly for day trippers as well. 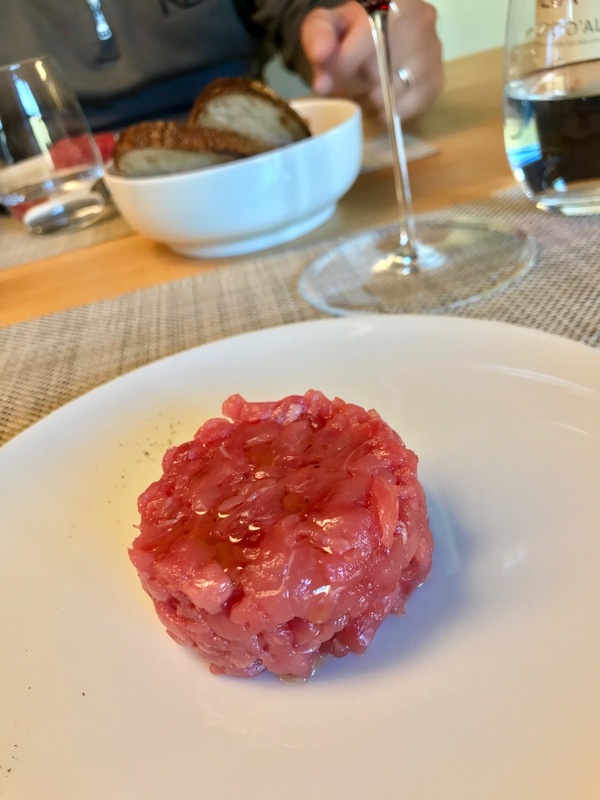 While I just visited here for a tour and tasting, I would definitely like to stay at this 12 room boutique hotel the next time I visit Piedmont.